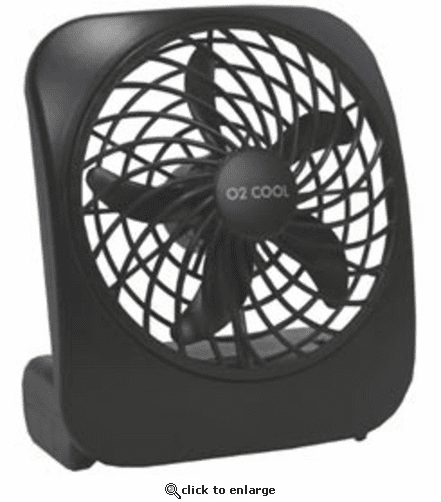 The popular O2 Cool 5-Inch Battery Powered fan now comes in black! This best selling style is great for your home, office or to use outdoors to keep you cool. This fan is compact and will run up to 55 hours on 2 D-Cell batteries. Love my portable fan! Great for hotel rooms. Takes up minimum space in luggage. Also great for power outages. (I live on Gulf Coast so that?�‚��"�s very important!) Would highly recommend this product! Bought a few to have on hand during the hurricane season here in Florida. Was not sure how powerful this item would be, and was pleasantly surprised at the amount of cool air that it generates. My wife bowls in two leagues each week, and she uses them to cool down between frames. I'll be coming back to get a few 10" cooling fans to have for the future. ProsVery light weight and provides a reasonably strong stream of cool air. ConsThe only downside that we found was that it was not easy at first to find a screwdriver that would remove the screw to get to where the batteries need to be installed. I would recommend designing a cover that would snap into place instead of having to find a screwdriver that is usually used for repairing eyeglasses. I work out at the gym and generate a great deal of heat - I sweat so much. I bought the fan to keep me cooler. It works great. The only disappointment is that I can't find rechargeable "D" size batteries. This is a great little fan. Powerful, quiet, long running and uses just 2 batteries. If you camp... this fan can't be beat. The price on this fan is inexpensive for such a nice product. ProsQuality, price, long lasting on 2 batteries, quiet. ConsNeed small screwdriver to remove screw on battery housing.